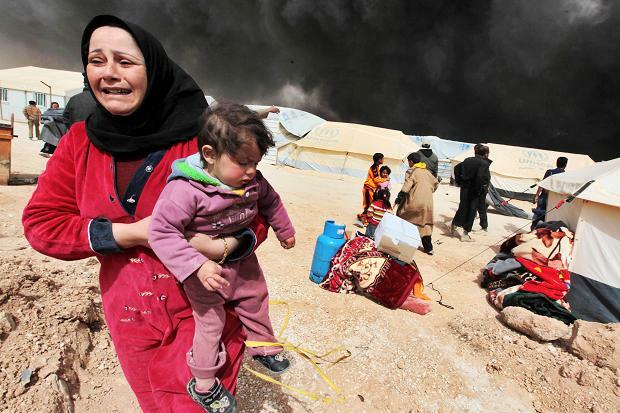 A Syrian woman rushes her child from danger. Yesterday we heard from national security expert Hakim Hakim, in our first Voices Against the Grain radio show interview. He effectively responded to the question, “Is God Sovereign in World Chaos?” The topic is timely as the U.S. determines what limited actions it will take to punish the Syrian government for their use of chemical weapons on innocent civilians, and deter an escalated use of future chemical weapons. More than 1,400 people have been killed by use of chemical weapons on civilians, including more than 400 children. Hakim read from Isaiah 45 and Romans 13 to show how God uses civil authorities as “ministers” to put evil and lawlessness in check. The authorities that exist have been established by God, and those who rebel against them will bring judgment upon themselves. The one in authority is God’s servant, agent of wrath to address wrongdoing. Can good outcomes still be accomplished by God if the civil authority is not a Christian? In one word: Yes. This is all part of God’s sovereignty. If you missed yesterday’s interview, click here to listen. Thank you Hakim for bringing great substance and understanding to this complex topic. For more on Hakim Hazim, visit his Christian-based consultancy Relevant Now and the blog he co-founded, FreedomSquared.